Mainland China gets much of the ink in today's business broadsheets. But just about 100 miles offshore, on estranged cousin Taiwan, historically low benchmark interest rates, high stock yields, comparatively low valuations, the island's seemingly contradictory role in the mainland Chinese growth story, and its own prolonged political gridlock have converged to create an unlikely perfect storm for buyouts. In December, a Merrill Lynch survey indicated that offshore investors, looking to purchase Asian equity in 2007, ranked Taiwan their number one target. Acquisitions have been across a range of sectors, both via traditional M&A and private equity placements. Just a few examples include Standard Chartered's $1.2bn purchase of Hsinchu International Bank last fall, in what was the first-ever foreign purchase of a Taiwanese lender. On April 9th, Citigroup announced its intent to buy Bank of Overseas Chinese (BOOC) for $426mn, at 1.27 times P/B ratio. Newbridge Capital has taken a 23% stake in Taishin Financial, which in turn aims to merge with state lender Chang Hwa Bank. MBK Partners bought a 60% stake in Taiwanese cable TV provider China Network Systems (Taiwan enforces a combined 60% ceiling for direct and indirect holdings by foreign funds in a cable television operator), as did Carlyle Group a 59.29% stake in Eastern Multimedia. Carlyle bid $5.4bn for Advanced Semiconductor Engineering in November, but the deal later fell through over price. But why Taiwan? Taiwan offers greater critical mass than Hong Kong or Singapore, more transparency than mainland China, lower price tags than Japan, and fewer headaches than South Korea. And while it is still recovering from a 2006 consumer lending crisis that saw banks write off more than $3 billion, not to mention a recent downturn in industrial production (mainly due to a global information technology inventory correction), Taiwan's economic fundamentals are basically solid. GDP is projected to grow more than four percent this year. Taiwan enjoys a large current account surplus and has the world's third-largest foreign reserves. Taiwan is also thought to be free from the religious tensions, coups, threats of terror, and kidnappings that plague parts of Southeast Asia. Perhaps best of all, Taiwanese authorities and citizens alike generally welcome takeovers. Buyers, like MBK, can face intense questioning from regulators, but the idea of foreign ownership is rarely controversial. 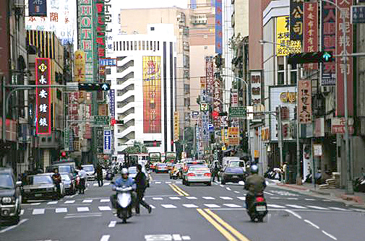 In fact, local residents have been known to applaud foreign buyers for taking an interest in Taiwan. Taiwan is however, as mentioned above, in a state of prolonged political gridlock. First Lady Wu shu-Chen is on trial for corruption, as is opposition presidential hopeful, former Taipei Mayor Ma Ying-jeou. Government is bitterly divided, fit with clashes over ethnicity and identity, even within political camps themselves. With legislative elections set for December, and a presidential election next March, neither side is expected to give ground on key issues. But the resultant policy logjam, particularly in terms of economic relations with mainland China, has only fueled the acquisition fire. Mainland China is, ironically enough, Taiwan's number one "export" market. Taiwan is also the number one offshore investor in mainland China. At least half a million Taiwanese live there. Yet, because of security-related fears over its industrial base being absorbed into a potential military adversary, Taipei restricts mainland investments to 40% of companies' net worth. Taiwanese businesspeople, who should be capitalizing on their innate competitive advantage on the other side of the Taiwan Strait, are thus kept at an artificial distance from customers, many of whom who have shifted production there. These restrictions, meant to preserve Taiwan's manufacturing base, in practice only serve to punish those firms that stay in Taiwan. Like it or not, mainland China is the key link in today's global supply chain. A fear of absorption, albeit an understandable fear, is being trumped daily by the quantifiable reality of global economic isolation. Beijing's self-proclaimed right to use force against Taiwan, should the island formalize its de facto operational independence, only serves to further the estrangement across the Taiwan Strait and to dash hopes of greater economic cooperation. To be fair, Taiwan has its own band of saber rattlers, some of whom even sit in the Executive Branch. But at least they, unlike their mainland counterparts, are held to account by their own people every four years. But assuming Taiwan's territorial integrity can be assured (which it can be, so long as the United States - not to mention Taiwan itself - remains committed to the island's defense), it is to Taiwan's own strategic advantage to find some way to "normalize" at least outbound economic relations with mainland China. Taiwanese companies would almost immediately regain their leading position on the world's assembly line, i.e. southeastern mainland China. Considering that Taiwan outpaces most of the world in patents and PhDs per capita, metro Taipei and the Hsinchu Science Park would be instant intellectual capital, value-add hubs of any Chinese-speaking regional market. The same goes for the southern port city of Kaohsiung in shipping and logistics. Multinationals would be interested in Taiwan again, as would be their respective foreign governments, eager to promote their companies' interests there. But given the current cross-Strait economic impasse, a few local firms (particularly those in the hi-tech sector who face their own unique technology transfer issues vis-�-vis the mainland) have begun to semi-openly entertain the notion of foreign buyouts as a means to circumvent these restrictions. Companies like Hon Hai Precision Machinery, Pou Chen Corporation and Great Wall Enterprise have even spun off their mainland assets into separate entities and relisted those new units in Hong Kong. But not all Taiwan's acquisition drivers are mainland-related. For example, the island has 2.75 bank branches for every 10,000 people (the world average is 1.95). Authorities have, for years, paid lip service to the need for industry consolidation, but precious little has been done, until now. The Financial Supervisory Commission (FSC) was launched in 2004 to, among other things, act as a one-stop shop to facilitate that consolidation. The FSC has been successful in continuing to bring down non-performing loans from a high of 11.76% in April 2002 to 2.3% in March 2007 and in marketing Taiwan's financial services sector to the outside world. Last year, insurers Aviva (U.K.), HSBC and RGA Global Reinsurance (U.S.) all opened Taipei branch offices. On April 26th, Aviva further announced a joint venture with First Financial Holding Co., owner of Taiwan's second-largest bank network (187 branches). But the FSC has also had three chairpersons in as many years and has been the repeated victim of inter-agency turf wars. Vague policies, Byzantine branch licensing requirements, and recurrent state intervention have only further stymied the agency's consolidation goals. But last year, in an effort to prevent Taiwan from becoming even further "over-banked," the FSC forbade all banks, local and foreign, from opening new branches. The only way to grow was now through acquisition. Hence, the recent buys from Standard Chartered and Citigroup (Citi's BOOC purchase will net it 65 new branches). Last year's consumer lending write-offs also mean that Taiwanese banks are now, on average, significantly cheaper than their regional peers. In April, the FSC amended its rules, so that a foreign holding company can now also establish a locally incorporated subsidiary to acquire local banks. New FSC Chairman Hu Sheng-cheng went out of his way to welcome further foreign participation in Taiwan's banking sector (Asia's fourth largest), hinting that more deals are on the way. Top card issuer Chinatrust Financial, for example, indicated on April 30th that it might sell off at least a 10% stake to foreign investors. A would-be foreign suitor has also apparently expressed $300mn worth of interest in China United Trust & Investment Co., currently in the red. But a few skeptics in Taiwan fear that private equity plays in particular, be they in the financial sector or otherwise, will result in a slew of local firms being delisted, thereby weakening Taiwan's capital market and triggering a sharp investment outflow. But these fears are largely unfounded, as funds generally aim to take their acquired assets, or at least parts thereof, public again. In fact, as evidenced by Hon Hai, Taiwan's own restrictions on trade and investment with mainland China are the primary incentive to de-list and to send capital offshore. Because of its diplomatic non-status, Taipei's efforts toward trophy achievements like a free trade agreement (FTA) with the United States, while noble, are wholly quixotic (for now, at least). An FTA with the United States, diplomatically unthinkable for Washington to begin with, is even more unlikely, given the absence of normalized cross-strait economic relations. U.S. and Taiwanese companies have little or no stake in an FTA that does not allow them to freely service and supply their mainland-based facilities and customers. But Taiwan can help its own cause, in real terms, by maintaining today's favorable acquisition climate. So long as detractors cannot demonstrate that hi-tech firms are being systematically dismantled for deliberate reconstitution offshore, the Investment Commission within the Ministry of Economic Affairs should not stand in the way. Renewed foreign interest in Taiwan's beleaguered (yet, potentially profitable) banks, broadcasters, hi-tech juggernauts, resilient consumer base, and position as a foreign-friendly platform from which to launch and service operations in mainland China will only raise Taiwan's global profile. These transactions also usher in much needed capital, managerial expertise, and ipso facto, long overdue market reforms. Observing the world's best and biggest funds firsthand, local private equity firms can then also get in on the act, acquiring valued assets at home and abroad. However, even if Taipei does lift its restrictions on mainland-bound investments, it should retain every right, so long as Beijing keeps its 900+ missiles trained on its shores, to block select mainland-originated purchases on security grounds. One can, for example, hardly imagine Israel opening up wholesale to Syrian investment. But those concerns are for another day, and for another audience. Foreigners interested in Taiwan should act soon, before the best deals are done and before valuations climb again. Taiwan's ruling Democratic Progressive Party is serving up tasty stimuli treats ahead of next year's presidential election, and the opposition Kuomintang is already talking about potential trade deals with mainland China, should it win. If so, increased numbers of inbound mainland tourists and higher real estate prices will follow. Get in while the going's good.